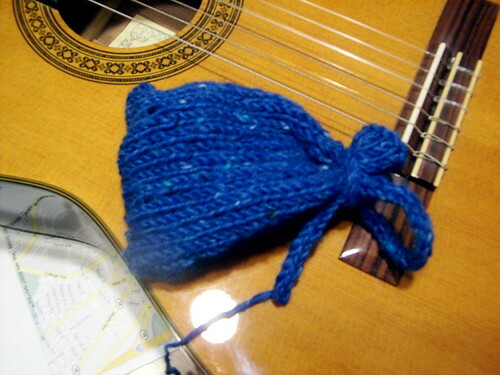 A while ago I knitted a little pouch using some leftover Noro and started using it to hold little guitar-related things: a capo, a slide, some guitar picks, an egg shaker. Unfortunately it was in my guitar case when the guitar was stolen, so yesterday I decided to knit a new one using some leftover Tahki Donegal Tweed from the blanket I finished knitting a couple of days ago. I think this used about 50 yards of yarn. I used size 6 straight needles. (Ideally you'll also have some DPNs of the same size to make the end easier.) Here's general instructions for making this sort of pouch. 1. Cast on an even number of stitches. (I used 30.) The cast on row should be a little less than twice as wide as you want the bag to be. 2. (s1, p1) to end, ending with a purl stitch. 3. s1, P1, and pass the slipped stitch over the purled stitch. (s1,P1) to end, ending with a purl stitch. 4. s1, P1, and pass the slipped stitch over the purled stitch. (s1,P1) to 2 stitches from end (ending with a slip stitch). P2tog. 5. (s1, P1) to 2 stitches from end (ending with a slip stitch). P2tog. Until now you've been working both sides of the bag on a single needle. Now it will be necessary to separate the two sides onto different needles. To do this, take two DPNs, slip the first into the first (slip) stitch and hold it to the back of the work, then slip the second into the second (purl) stitch and hold it to the front of the work, and repeat until all the stitches have been transferred to the two needles. You should now be able to draw the two needles apart and look inside the bag.